Downtown Las Vegas New Year’s Eve party counts down to 2008 in Vegas style. Fremont Street Experience welcomes the Bangles with “Manic Monday” and The Doobie Brothers with “Taking It To The Streets” at America’s Party Live in concert. The streets downtown will be filled with several live bands to rock the crowd. The action on the street will include the Globe of Death incredible motorcycle show with the Riders of the Thunderdome. 90 feet above the street will be the glorious Viva Vision showing the sites and sounds of the new year. 10 downtown Las Vegas casinos will be transformed into the largest private party. Tickets for the NYE event are available by calling 877 834 2748. The celebration will include 12.5 million lights, nonstop entertainment, classic Las Vegas neon and an exciting party. The Doobie Brothers defined the sound of 1970s California by combining elements of rock, jazz, folk, gospel and blues. In addition to the festivities downtown, the famed Las Vegas Strip will have the Grucci fireworks extravaganza from seven Las Vegas NV hotels. The fireworks will extend for more than eight minutes into the 2008 new year. The daredevil motorcycle team, inside the Globe of Death, attain speeds of 40 mph inside the 14 foot globe simultaneously. 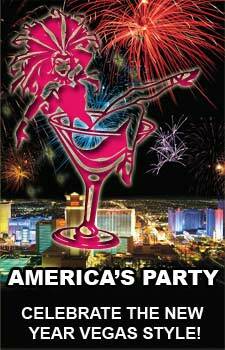 The electric party tonight starts at 6:30 p.m. within the Fremont Street Experience. Guests can access the venue at Fremont and 4th, Fremont and Main, Fremont and Casino Center. Parking is available at the Fremont Street Experience parking garage on the corner of Carson and 4th. The New Year’s Eve celebration at the Fremont Street Experience brings partygoers to Downtown Las Vegas, Nevada every year and has become a tradition for locals and visitors alike. Call 702-505-6988 for VIP Las Vegas luxury homes search with a Las Vegas REALTOR. Downtown Las Vegas New Year’s Eve Party counts down to 2008 with fun.